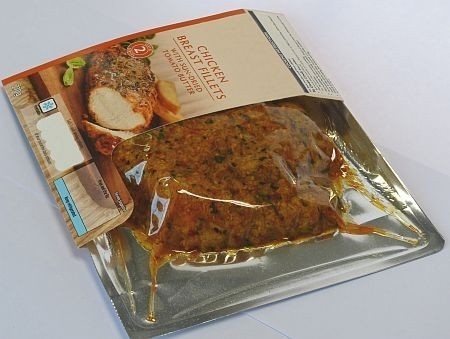 Market leading food packaging specialist KM Packaging Services Ltd has launched a new range of ovenable films under its Superguard range, called “Superguard Oven”. These films are designed to be used on Thermoforming machines (base web and top web seals), enabling food manufacturers to easily seal meat, fish and sauce based products into a pouch suitable for conventional ovens or microwaves. The Superguard Oven range includes base web ovenable films for shallow thermoforming, and top web films that are available in high oxygen barrier, metallised or transparent and supplied with or without anti fog. The Superguard oven pouch can be credited with speeding up preparation and cooking times, reducing cooking odours and also retaining moisture in the products as they cook. Where meats and fish are packed with sauces the Superguard oven pouch will also effectively allow the meat and fish to marinate while packed and prior to cooking. Superguard Oven is a cost-effective alternative to premade ovenable trays which are usually manufactured from CPET or Aluminium. With no tray, the total pack weight is considerably lighter which offers excellent environmental benefits. Merchandising of the pouch is also afforded more flexibility than traditional trays with options to stack upright, or hang from a header card or half-sleeve. These features ultimately benefit the consumer too, who can simply slide the pouch straight from sleeve to oven tray for mess-free cuisine. Calling on its extensive technical expertise in lidding solutions for trays, KM Packaging developed Superguard Oven in response to the growing demand for “home cooked” style ready meals which combine quality ingredients with convenience and minimal preparation. The pouch has undergone exhaustive testing to ensure its performance will meet the demands of customers across the world, KM Packaging revolutionised the ready meals industry with its lidding films for aluminium foil trays and has since continued to invest in new technologies and flexible packaging solutions.